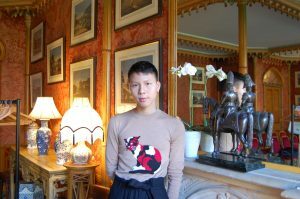 An is originally from Hanoi, Vietnam, but moved to Brighton two years ago for university, taking a five-year detour via Singapore en route. The outfit they brought with them to their interview consists of a satin coat by Olivier Theyskens with ruched shoulders and panel detailing, worn usually by An as a dress with nothing underneath but a tight top and a pair of ballet shoes. An bought the coat-come-dress, a collectors’ item from 2001, in 2016 – a time when they first began gaining the confidence to wear clothes that reveal a lot of their body. Debuted at a friend’s birthday party, this piece marks a very important and pivotal moment in An’s life, they explain. An initially began expressing their identity in their first year at the University of Brighton with delicate fabrics such as satin, crepe and fine knits, before moving on to more obviously, traditionally feminine styles (balloon sleeves, dresses, high waists, etc.) The freedom to experiment with light, soft pieces was a relief after life in Southeast Asia, where heavy garments are traditionally employed to assert masculinity. An’s feelings towards the gender spectrum vary from day to day. Sometimes they’ll opt for menswear, sometimes for womenswear, and sometimes for a ‘Frankenstein’s’ amalgamation of all of the above. ‘Because it’s so inconsistent, I don’t ever feel as though it’s adequate enough for me to explain for someone the definition of non-binary.’ That’s where clothes help.